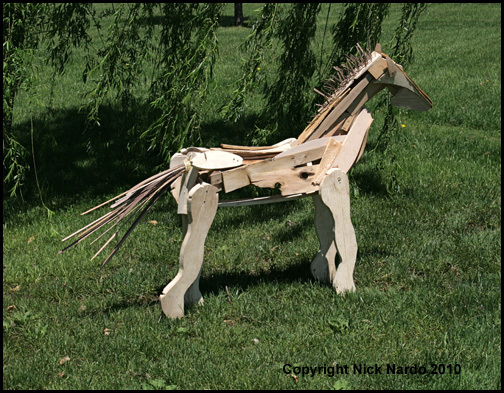 A unique horse was created by Nick Nardo from scraps. How’s that for recycling? While exploring through piles left over wood in the wood bin. These scraps were from other woodworkers at Kean University of Union, NJ. Nick, a future art school teacher, was attempting to complete his art class assignment. 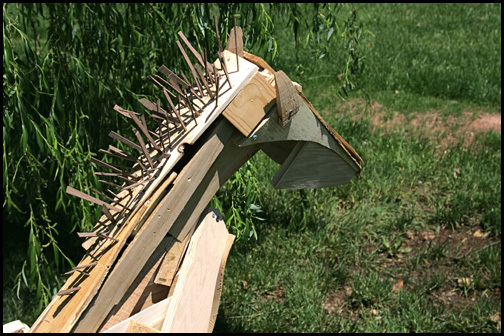 Then he saw the pieces that would become “Scraps the horse” . Piece by piece Nick constructed a work with both beauty and grace. Notice the forms shown. The forms are implied . Nick does not attempt to fill in every available space in the wood. So, your mind is forced to fill in those spaces. What is your mind saying about the spaces in this 3D art creation called “Scraps?